… with lots of helium! I had taken a few shots of these cute sisters holding their balloons high over their heads, but this one turned out to show their playfulness the most. Thanks for leaving some love! Now … Pop over to the I Heart Faces site (just click on the camera) to see lots more entries from fantabulous photographers! This entry was posted in Children, Families, I Heart Faces and tagged Children, Families, I Heart Faces, iheartfaces, Kimmswick, natural light, St Louis area photographer of families and children, summer. Bookmark the permalink. 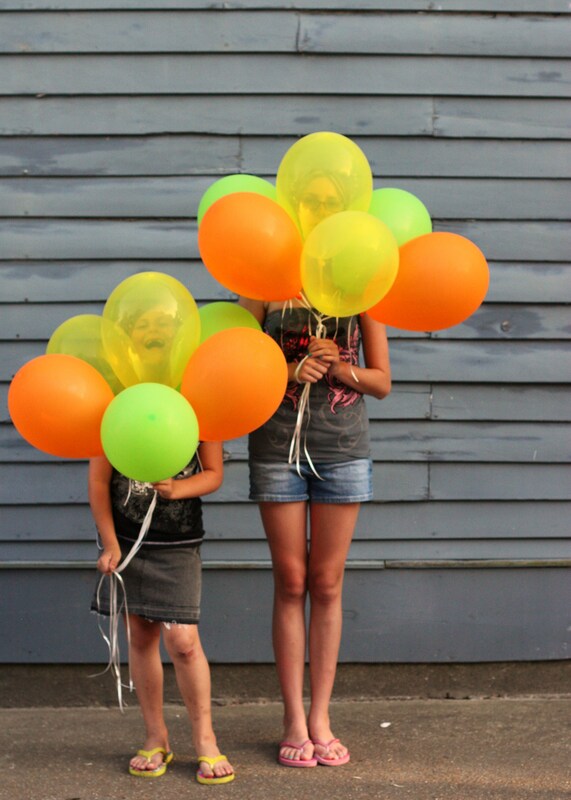 What a sweet funny couple of girls—and those balloons make me think of popsicles with those bright summery colors! Love the joy on Younger Sister’s Face. awesome photo! i love the color of the balloons against the drab background. Thanks for dropping by my blog… I love the background!!! Nice picture.